In Colorado, Wolf Creek Summit received 30% of total WY 2008 precipitation in 12 days from an AR event. In Colorado, an AR event in December 2010 gave Wolf Creek Summit >25% of snowpack accumulation for the season over an 8 day period. In Colorado, the AR storm ending on Feb. 1 in WY 2016 delivered ~4” additional SWE to the San Juan Mountains. The NRCS basin-scale SWE condition plots below use non-exceedence probabilities to project a range of future snowpack conditions, from the least likely (historical max and min traces) to the most probable (50% trace), based on the historic record. Statewide, NRCS indicates a nearly 10% non-exceedance probability of achieving at least a median snowpack. Even if most Colorado basins received their historically minimum SWE for the remainder of the season, they would still be near normal for the snow season. As they become available in early march, similar NRCS site-specific projection plots will be posted to each CODOS site’s web-page. To augment SNOTEL data and better understand snowpack conditions it is important to consider data collected in Senator Beck Study Basin (SBSB). SBSB is located at, or near, the headwaters of four major watersheds (Animas, Uncompahgre, San Miguel, and Rio Grande) and is the only high alpine study site in the region collecting comprehensive snowpack information. Being a headwater study basin, the elevations that we collect snowpack information and continue meteorological station monitoring is well above the highest of most SNOTEL stations (please see below). The NASA sponsored SnowEx campaign was an intensive snow data collection campaign that took place February 6-10 and February 20-25 in Senator Beck Study Basin (https://snow.nasa.gov/snowex). The table above summarizes data collected from snow profiles throughout the Basin. For comparison, SWE values are provided from Red Mt. SNOTEL. 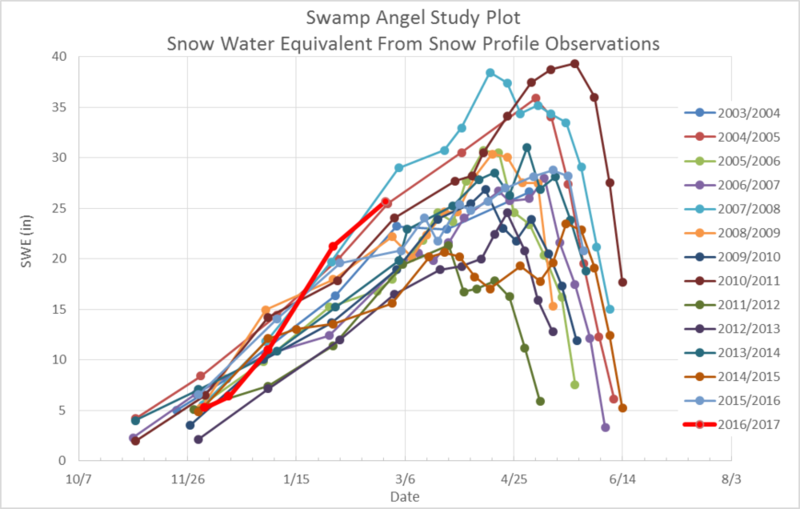 At Swamp Angel Study Plot (SASP), for our 13 year record, as of March 1st WY 2017 snow water equivalent is the second highest on record with an observed SWE of 25.7”. Snow depth at SASP is right at average for this time of year. Compaction and metamorphism have made the snowpack very dense. 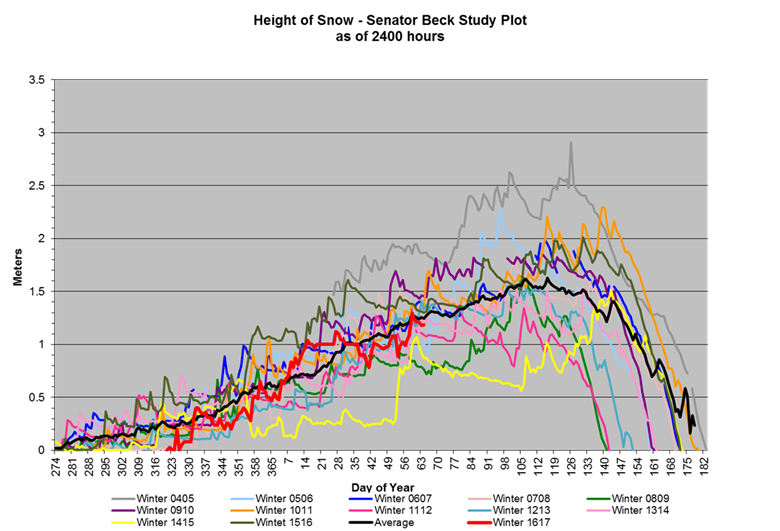 Senator Beck Study Plot snow depth is also very near average for this time of year, and, like SASP is very dense from wind redistribution and metamorphism. Plot of SWE at Swamp Angel Study Plot for the last 13 years. WY 2017 is the red line. March 1st observed SWE (25.7”) is the second highest on record. Plot of snow depth at SASP. Red line is current WY 2017. Plot of SWE at Senator Beck Study Plot for the last 13 years. WY 2017 is the red dot. So far Colorado’s winter has been dominated by the effects of global ocean-atmosphere cycles. El Niño Southern Oscillation (ENSO) has been in a positive phase with La Niña conditions in the Pacific Ocean. La Niña and El Niño are opposite ends of the ENSO cycle, which refers a sea surface temperature anomaly in the east-central Equatorial Pacific Ocean. During a La Niña year cooler surface water is found in the Eastern Pacific, with warmer surface water in the Central Pacific (The opposite is true of El Niño years). Similar patterns are found in the atmosphere during these cycles, as the ocean is highly capable of influencing temperature in the atmosphere. La Niña phases are often associated with drier winters in the Western US, which has not been the case this year. In contrast, a very strong El Niño ended last year but did not produce the consistent wet weather in the Western US that is typical of the pattern. 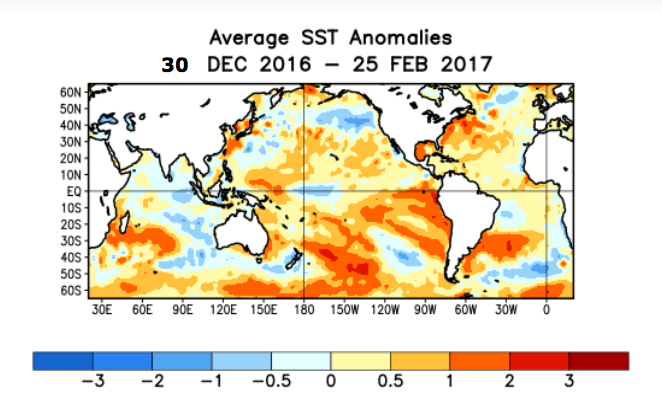 Instead, this years weak La Niña picked up the slack, with a good bit of help from record warm Northeastern Pacific Ocean temperatures. In addition to a long-term Pacific Ocean warming trend, the warm ocean along the North American coast is a component of Pacific Decadal Oscillation (PDO), another global ocean-atmosphere cycle. Positive PDO, which is the current condition of the cycle, is correlated with warm North and East Pacific ocean temperatures. PDO is often associated with the warm moist weather that has been observed in many parts of the Western United States this year. PDO is also associated with atmospheric river events. As above mentioned, several of our more productive storms this year have been associated with atmospheric rivers. Positive Pacific Decadal Oscillation sea surface temperatures. Working together, PDO and La Niña have contributed to record snowfall in many parts of Colorado and the Western US. The combination of these two major patterns produces significant and complicated temperature anomalies at various depths in the Pacific and in the overlying atmosphere, and the result of these extreme temperature differences has been increased storm moisture in the Western US. As of mid-February, however, our La Niña conditions have stabilized with Equatorial Pacific Ocean surface temperature anomalies approaching zero and we have moved into a neutral ENSO period. ENSO index returns to neutral as spring approaches. While PDO is still in strong, the season will likely continue to take a turn for the drier and warmer over the next few months. Currently, the March outlook indicates equal chances for both temperature and precipitation to be above and below average, so our long term forecast for the next few weeks is for average March weather. March precipitation in the SBSB is on average lower than most other snowy months, but on a 13-season average the basin receives 104.3mm of precipitation as snow, with little or no recorded rain. Upper elevation temperatures average around -5° C for daytime highs. Keep in mind that these are very long-term projections, especially the MAM outlook, and act more as guidelines for the most likely average conditions based on historic and current climate data. Over the course of our 2005-2017 period of rigorous observations, March 1st has marked the beginning of the heart of “dust-on-snow season” for the Colorado Mountains (see the CODOS Dust Log chart of dust events by month). So far for WY2017 at Senator Beck Basin, the primary ‘sentry site’ for the CODOS program, we have logged zero dust events. There have been a few observations where specific areas (Red Mountain Pass, Aspen locale) that have seen dust-on-snow that originated from adjacent, nearby sources. These occurrences are very local in nature, cover very little of the overall landscape, and have since been covered by subsequent snow accumulation. As of March 1st, Colorado SWE remains “high” among major basins, with every basin reporting greater than +10% deviation from 1981-2010 median levels. (DERC “Average” SWE equals day median +/- 10%). The basins listed below are classified according to the appropriate DERC classification of either Low, Avg, or High March 1st SWE layer domains. 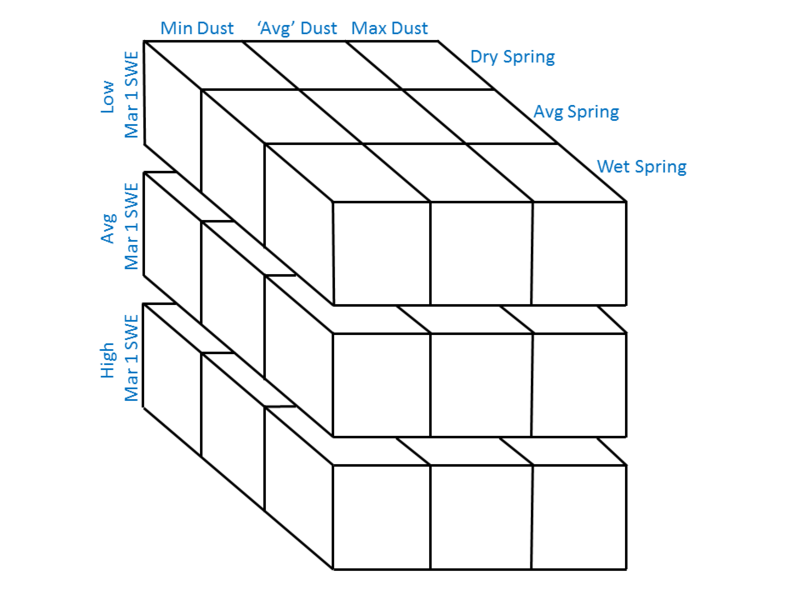 As described on the CODOS website, the DERC framework will be utilized to identify prior years with similar patterns of dust-on-snow intensity, March 1st SWE, and spring precipitation conditions, and their associated hydrographs. March 1st SWE analyses have been performed for each CODOS site. From this, hydrographs from 2006-2016 with associated March 1st SWE conditions have been identified and included in the analyses. Precipitation in the dust source region (Southern Colorado Plateau) has been abundant this winter, assisting in wetting and stabilizing soils and keeping a lid on dust mobilization. And, from field reports, the landscape appears well wetted from the precipitation events thus far this winter season. The image below shows soil moisture ranking percentiles for areas including the Southern Colorado Plateau. It now remains to be seen how WY 2017 dust conditions and spring precipitation evolve, and to further define the set of plausible hydrographs using prior season examples. For individual SNOTEL stations associated with our eleven CODOS sites, March 1st SWE ranges from 109%-202% of median levels. March 1st SWE conditions were classified for the SNOTEL station directly associated with each CODOS site, and also for select nearby SNOTEL stations. Prior seasons with similar March 1st conditions were identified and placed within the appropriate dust enhanced March 1st SWE space. Local watershed hydrographs (from 2006-2016) associated with those March 1st SWE conditions are presented as plausible examples of runoff behavior in spring 2017, with the understanding that these prior years exhibit a limited variety of 2006-2016 dust and spring precipitation conditions for each CODOS site.